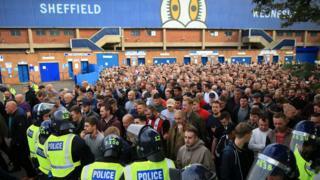 Football fans have criticised the police's "shambolic" handling of supporters at the Sheffield derby. South Yorkshire Police thanked fans for good behaviour after Monday's Steel City Derby at Hillsborough, despite trouble at the ground and six arrests. More than 60 people took to Twitter to complain about disorder, with fans clashing, missiles thrown and children caught up in the trouble. Police say they will "talk with supporters groups from both teams". Trouble started during the Sheffield Wednesday v United match when objects were thrown at Blades defender Jack O'Connell when he was taking a throw-in. The game ended 0-0. Fans from both sides said police should have held United supporters back after the game. Match commander Ch Supt Shaun Morley tweeted his thanks for "overall positive behaviour", but was immediately criticised for "shambolic" policing. Wednesday fan Jayne Whittaker said her grandchildren had to be "plucked to safety" from a crush by United fans. Barbara Wood called the experience "terrifying", with "children and innocent fans on both sides" in fear. Ch Supt Morley said while most fans were well behaved, a minority had taken the opportunity to throw fireworks, coins, cans and stones after the game. "As with any large-scale operation we will be completing a full review of police planning for the match last night to ensure lessons can be learned ahead of similar fixtures," he said. "As part of this, we are talking with supporters groups from both teams." Last month South Yorkshire Police launched an advisory group so fans, police and football clubs can improve communication and shape matchday policing. I understand the United fans were held back for 10 minutes last night, pre-planned. So the question is was that long enough? Most football matches see both sides' fans leaving at the same time but, increasingly, derby matches and big occasions see fans - normally the away side - held back. It's one tactic of many, and down to the specific operation.